There are many signs pointing to a false flag attack in Brussels on 3-22-16. Independent and alternative media, as usual, has been right on top of the story catching many of the usual oddities, lies and coincidences which are characteristic of false flags and are now piling on top of each other as they always do. And here's another thing everyone should take note of. Something we also observed during the Paris attacks on 11-13-15. As we saw in the Paris attacks, once again we're seeing a "global" component to the "reaction" phase of the usual problem-reaction-solution dialectic employed by the controllers. Look for it. Problem at point A, subsequent "reaction" to the problem at point B, all the way on the other side of the world. This then leads to a "solution" that applies to both point A and B. This also serves to endorse the illusion that the boogeymen, in this case ISIS of course, involved in the Brussels attack are somehow everywhere at once. One of the key purposes of this event, among other purposes like maintaining an excuse for U.S. military intervention in Syria, is to reinforce the need for a global police which is being sold as a "global solution" to a "global problem". 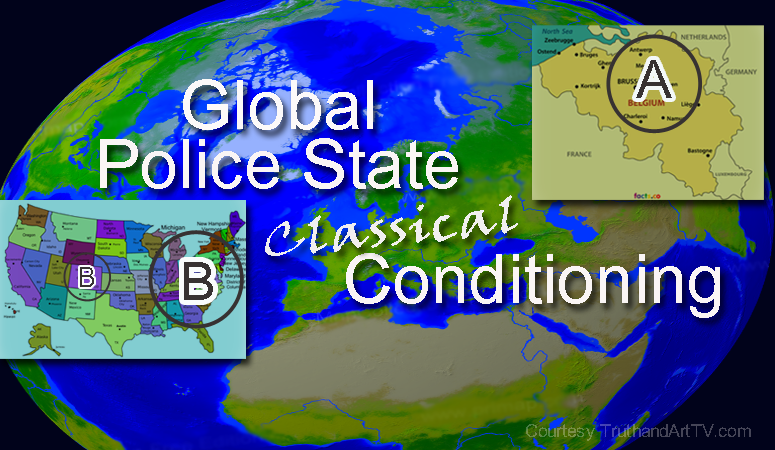 This global police state is a very clear agenda of the U.S., NATO and the U.N.. This entire event is also designed to push the Authorization for Unlimited Military Force (AUMF) the Pentagon wants so badly and it's a perfect quick and easy event in NATO's and the European Unions home turf to push for all of these goals at once. What am I talking about? Atlanta's airport was briefly evacuated on Wednesday over a suspicious package while U.S. law enforcement agencies and travelers were on edge a day after deadly suicide bombings by Islamist militants rocked Brussels. As you can see, the hysteria wasn't just in Atlanta. Notice the article doesn't even bother to discuss what exactly happened in Denver. Was it also a "suspicious package" there? Was it a phone call from ISIS? Who cares right? Because apparently the only thing that matters is that it's part of the "reaction" phase and the true answer is, this is part of the mass conditioning for the new world order's global police state which is now being born with every ISIS "attack". So for the first time in human history an event at point A in one side of the world forces a Pavlov style reaction at point B, on the opposite side of the world; even though the 2 events (in the organic reality) have no association with each other other than the conditioned response. The conditioning of the masses can be compared to Pavlov's dog experiment. In the Pavlov dog salivation experiment Russian physiologist Ivan Pavlov was able to demonstrate that dogs can be conditioned to organically react a certain way by simply associating one artificial stimulus enough times with a natural stimulus. Eventually Pavlov demonstrated that you wouldn't need the natural stimulus (food) to elicit the conditioned response (salivation) if you provide the artificial stimulus (a bell). If you understand Pavlov's classical conditioning then you should understand the mass conditioning going on right now on the masses via the mainstream media and politicians. The Brussels attacks is no different from the Paris "attacks" of November of 2015. Isn't it a coincident that less than a week ago the mainstream media brought back the Paris attack "story" as if to prepare the masses subconsciously for the upcoming Brussels attacks in Belgium? How about the fact the Turkish president Recep Tayyip Erdogan basically subliminally announced the upcoming attacks 4 days prior? Are we surprised given that Erdogan's Turkey is right now the primary lifeline for ISIS purchasing their oil and supporting fighters with resources in the Turkey-Syrian border while blowing up Russian planes that interfere with that mission? This has all the markings of a mass psychological operation. First of all, we don't know who planted those explosives in the Brussels airport or subway system and we don't know why or who told them to do it. With ISIS being credited, that alone is proof as far as I'm concerned that this is a state crime funded by NATO countries. We must all shed the myth that ISIS fighters are freely doing what they want, independent of the will of the states that created, funded, trained and armed them. Think about this. No one trains fighters only to let them go away and fight for someone else. Whoever trained these guys is still giving the orders or they wouldn't have wasted their resources training these guys. Just like in the U.S. military. You wouldn't train a Marine in boot camp, show them how to survive and offer weapons training only to watch them leave the Marines after boot camp and fight elsewhere. Yet this is precisely what Americans are asked to believe every day by the mainstream media. We're told to believe these fighters just so happened to switch sides AFTER being trained to fight for the "Free Syrian Army". If it wasn't that ISIS is a mercenary group employed by NATO countries, they'd be long gone by now. The only reason ISIS is still "alive" in our consciousness is because nations like Turkey, US, Israel and Saudi Arabia are keeping them alive both literally and figurative using their controlled media. ISIS is therefore alive because they (U.S., NATO and company) want and need them to be alive for political reasons. No ISIS means no Syria, no PNAC Middle East plan completion, no fear, no war on terror, no global police and no stripping away of individual rights, it's that simple. Incidentally the location of the explosions in Brussels Belgium is immensely convenient. There's no question that the headquarters of NATO and the European Union would be a perfect place to execute and control a false flag like this. This is also the perfect false flag to quickly put together during this election year campaign hysteria pause. It likely took very little coordination and effort requiring a couple of explosives and a patsy or 2. Here's the sequence as I see it: Boom! ISIS did it, lockdown airports in the U.S. due to an unattended package, goals and conditioning reinforced by media, back to election campaign with the candidates calling for "solution" to ISIS. This is the part where ALL politicians running for president get to offer their "solution" to the same artificially created "problem". In other words this is a win-win for the ruling elite. And in this sense the Brussels attack is already part of the election campaign itself. Be on the look out for candidates endorsing ideas "global solutions" to ISIS. Finally, I call on readers to observe how these false flags are getting easier and easier for them to do. I'm sure there was a time when a false flag attack like this took years to prepare (think 9/11). Now we are seeing quick attacks being strung together with minimal preparation, attacks which nonetheless have long lasting implications for freedom, the rise of the global police, obtaining their AUMF license to kill, and obtaining all the excuses they need to justify U.S. aggression in Syria in hopes of forcibly removing their democratically elected president. Remember practice makes perfect. So as they get better and more efficient at pulling these false flag attacks, let us get better and more efficient at diagnosing them and spreading the word. I believe both phenomenons are happening simultaneously. Hopefully the ability of alternative and independent media to quickly diagnose these attacks by simply observing the process of- problem-reaction-solution will help us turn a corner in changing minds at the highest level and thus effect much need change sooner rather than later.